This textbook, which can be studied either individually or in a classroom environment, includes a compendium of resources available online with sixty-one audio examples corresponding to scores in the book, as well as separate PDF files of all the assignments. Jazz Theory and Harmony, principles of jazz voice leading, voicing techniques, rules governing music calligraphy, chord symbol nomenclature, and jazz notation and articulation are presented in a very systematic, step by step approach. Attention is given to the function of each instrument in the ensemble, including their range, register, transposition, dynamic capabilities, and idiomatic characteristics. Please browse the files available below to access the files referenced within the book. 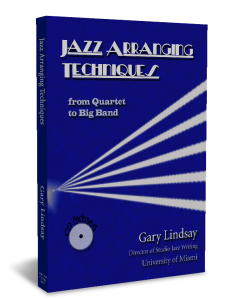 To learn more about Jazz Arranging Techniques, click here. 16) Unison/Octave: Bass Clar. / Trbn. (bucket) / Ten. Sax. + Trpt (bucket) / Fl.